B catarrhalis causes bronchitis and pneumonia in patients with underlying lung disease, especially chronic obstructive pulmonary disease. It is also a rare cause of invasive disease, including meningitis, endocarditis, bacteremia without a focus, septic arthritis, and cellulitis. In addition, it is a recognized cause of acute conjunctivitis and is periodically mistaken as Neisseria gonorrhoeae in newborn infants with conjunctivitis. B catarrhalis occasionally colonizes the genital mucosa and has been reported as a cause of urethritis. The signs and symptoms of B catarrhalis acute otitis media and sinusitis are indistinguishable from those present when acute otitis media and sinusitis are caused by other pathogens (Box 8). However, episodes of B catarrhalis otitis media are more likely to resolve spontaneously than are those caused by Streptococcus pneumoniae or H influenzae. The clinical manifestations of lower respiratory tract infection caused by B catarrhalis also are similar to those caused by other bacteria. Episodes of bronchitis in patients with chronic obstructive pulmonary disease are characterized by increased cough, purulent sputum, shortness of breath, and sometimes low-grade fever. Pneumonia due to B catarrhalis occurs almost exclusively in elderly persons and in patients with chronic obstructive pulmonary disease and is characterized by fever as high as 39.4 °C, cough, purulent sputum, and shortness of breath. Nasopharyngeal and throat cultures are not helpful in establishing a microbiological diagnosis but can be useful in excluding certain organisms. Tympanocentesis is necessary to establish the etiology of otitis media, and sinus aspiration is required to confirm the cause of sinusitis (see Table 2). However, these procedures are rarely performed. In patients with pneumonia, auscultation sometimes reveals evidence of consolidation, and chest radiograph sometimes shows patchy or lobar infiltrates. Pleural effusion and empyema are uncommon. 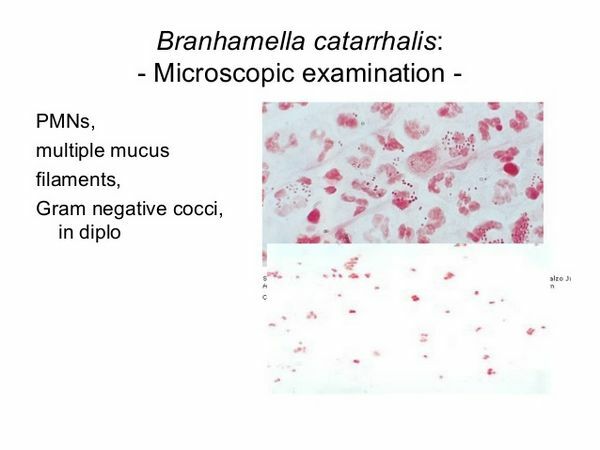 The most practical approach to establish the diagnosis of B catarrhalis pneumonia or bronchitis is to examine a gram-stained sputum sample, which will show a predominance of intracellular and extracellular gram-negative diplococci. Approximately 80% of isolates produce ß-lactamase, and at least three different B catarrhalis ß-lactamases have been identified, including BRO-1, BRO-2, and BRO-3. The activity of these ß-lactamases can be inhibited by ß-lactamase inhibitors such as clavulanate and sulbactam. Most B catarrhalis infections can be treated with oral agents, including Augmentin (amoxicillin plus clavulanate), erythromycin, trimethoprim-sulfamethoxazole, and tetracycline (Box 9). B catarrhalis is also uniformly susceptible to ticarcillin, piperacillin, mezlocillin, azlocillin, most second- and third-generation cephalosporins, chloramphenicol, newer macrolides, and aminoglycosides. B catarrhalis is resistant to penicillin, ampicillin, vancomycin, clindamycin, and methicillin. Approximately 1-2% of isolates are resistant in vitro to tetracycline or erythromycin. Isolates producing ß-lactamase may be reported by the clinical laboratory as susceptible to penicillin and ampicillin, because of the low activity of the BRO-ß-lactamases. However, clinical treatment failures with such organisms suggest they should be considered resistant to these antibiotics. Similarly, cefaclor and possibly other cephalosporins may be inactivated by the BRO-ß-lactamases. Currently, there are no measures for prevention and control of B catarrhalis infection. However, a number of laboratories are characterizing B catarrhalis surface antigens, hoping to develop a vaccine effective against this organism.